• Always bow in and out of the Dojo. Always bow to your partner before and after an exercise. • Shoes should be removed before stepping into the Dojo. • When late for class, bow in, do 10 push ups, and wait for the instructor to bow you in. • Always address the head instructor as Sensei. • Always pay strict attention to the instructor and not to other distractions. • Never leave the class for a break, water, or any early dismissal, except with permission. • Students should remove all jewelry before class, for their own safety and that of others. • No smoking, profanity or gum in the Dojo. • Practice what you are taught. • No sparring allowed without permission (ask an instructor for permission). Students must wear full protective equipment. • Never lose your temper in the Dojo, especially in self-defense, or free sparring. • Students must always keep their finger and toenails clipped and clean. • No horseplay in the Dojo. • Do not use the equipment unless authorized by an instructor. Do not borrow another person’s equipment without his/her permission. • Never talk during class except to ask or answer questions, or to discuss martial arts. • Do not ask to test. Your instructor will always inform you when you are ready. • As a sign of respect and responsibility, dues should be paid on time. • If you are the last to leave the Dojo, lock the front door and turn off the lights. 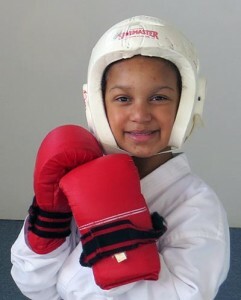 Classes at Moon Dragon are great — my son is a student. There are several black belts associated with the school, but most of the classes are taught by Master Allyson who is great with her students and has been a long-time contributor to the growth of the style. As a result, she is great technically, as well as is able to help everyone understand why things are done one way or another. All the students get individual attention, and it shows — not everyone is a natural athlete, but everyone looks sharp. It’s great having all the other black and brown belts to learn from, and the school is a nice, safe, supportive community. There are adult students as well as a tweens class, and it is a wonderful mix. The kids are so physical, but fun and a little silly, while the adults are a little less physical but more grown up in their approach to learning — and everyone learns from and looks out for each other.